Lower Manaslu Eco Trail trek is newly open in the lower region of Manaslu with its natural beauty and diversity. Gorkha, from where the unification of modern Nepal was started by King Prithvi Narayan Shah, is the first capital of Nepal. There are several places of historical and archaeological importance in the district. Blessed by nature’s splendor this land of historic, religious, ecological and cultural significance has every potential to be featured as one of the favored touristic destinations of the country. However, the number of tourists coming to this region is limited. The district is home to Mt Manaslu and the famous Manaslu Circuit Trek. Besides, the Lower Manaslu route offers moderate trekking, historical tour, pilgrimage tour, agro tourism and community based home stay. The locals are also committed towards development and promotion of tourism in the district. The Lower Manaslu Trek begins from Ghairung near the famous Manakamana Temple and progress through Gorkha Bazaar, Sirandanda, Barpak, Laprak, Lambai Kharka and Dharche Danda before concluding at Gyampesal. Accommodation is mostly on home stay or camping as commercial lodging is available in only a few places. Day 1: Arrival in Kathmandu Tribhuvan International Airport and meet with our representative at the airport and transfer to Hotel by private car. Welcome drinks and short briefing about your trek, relax. Overnight at Hotel. The journey begins with a drive to Cable Car Station at Kurintar that can be reached after a drive of three hours from Kathmandu. A 10-mintue cable car ride will take us to the historic Manakamana Temple (1315m) which was built in the 17th century. The temple draws pilgrims as well as tourists from Nepal and countries from across the world. The trek begins after lunch at Manakamana Bazaar. About 2 km north of Manakamana Temple lies the temple of Bakyaswori Mahadeva. The shrine is believed to have spiritual power as people believe dumb children start speaking after worshipping at the temple. About 500m further uphill is a Siddha Lakhan Thapa (founder of the Manakamana temple) sacred cave which also offers a magnificent view of Manaslu Himalayan ranges. Right next to the cave is a 250 years old temple built during the reign of King Prithvi Narayan Shah. From here, the trek descends to Tinmane Bhanjyang. The village also offers home stay facility. The day’s trek concludes at Pipalchap village in Ghairung VDC. As no lodging is available in the area, the village offers home stay facility for visitors. Overnight at Home-Stay. From Ghairung, the trek progresses toward the historic place called Bungkot — the birthplace of Nepal’s first martyr Lakhan Thapa. Apart from the historical attraction, another attraction in the village is the Lakhan Thapa Memorial Park. The park houses a bust of martyr Lakhan Thapa. It also has historical artifacts like swords of Lakhan Thapa and a stone spout. Locals are preserving these historical attractions on their own without expected external assistance. Magars are the dominant population in this village. Bungkot offers home stay facility and serve good food using locally grown organic products. An easy walk of about 1.5 hrs from Bungkot, takes us to Gorkha Bazaar — the district headquarters of Gorkha district. Here, visitors have several options for accommodation, ranging from star to budget hotels. Overnight at Lodge. The day is spent by visiting interesting places in and around Gorkha Bazaar. a) Gorkha Palace The historical Gorkha palace from where King Prithvi Narayan Shah started unification of modern Nepal lies about 1,000 ft above Gorkha Bazaar. The palace dominates the surroundings and is visible from all surrounding areas. It also offers visitors with fantastic views of green valleys and the Himalayan panorama. The palace also rich in terms of medieval architecture. b) Gorkhanath Cave The cave of Gorakhnath is situated about 10 meters below the palace. The cave is believed to be the shelter of Gorakhanath Baba (a great sage) after whom the district gets its name. The sage is believed to have been the guide of Shah dynasty. It is because of his guidance and blessing that the Shah dynasty could unify small principalities into modern Nepal. c) Gorkha Museum Gorkha Museum is situated at Gorkha bazaar. It has a wide range of artifacts and personal belongings of King Prithvi Narayan Shah along with his 52 feet long chino (birth details). Apart from these collections, it has also on display ancient art, sculptures, coins and several other articles of historical significance. Overnight at Lodge. A drive of about 6-7 hours from Gorkha Bazaar takes us to a village called Bhachek. The drive is a unique experience in itself as it passes through narrow and curvy mountain roads overlooking the Daraundi River. An easy hike of about an hour from Ghachek takes us to Sirandanda. Situated at an altitude of 1900 meters, Siran Danda (which means hilltop in Nepal) is true to its name as it sits on top of a small hill. It is inhabited by Hyolmo people. Major attractions in Sirandanda are: Nagepokhari, Dudhpokhari, Bhot dodar, Chima, Dharadi and a tea garden. It also offers a magnificent view of sunrise and the Manaslu range. The village has a rich diversity of medicinal herbs like nirmasi, jedamasi, jatamasi, rato unyu, yarsagumba and satuwa among others. Home stay facility is available in the village. Agriculture produce of the village is organic potato and unprocessed tea leaves. Despite having tremendous potential, Sirandanda is struggling to find its place in the country’s tourism map. Overnight at Home-Stay. A walk of about 1.5 hrs toward northeast from Sirandanda takes us to Mathar village (1790m). An easy walk for about 1.5 km from Matha takes us to Ghyachowk for our lunch. Though no hotels are available in the area, we can cask locals to prepare lunch. After a trek of around 4.5 hrs after lunch through Dewalsara, Sum River, Daraudi River, Goje and Alagang, takes us to the Barpak village (1920m). Barpak, mostly inhabited by ex-army men, is also popular as the village of Late Capt. Gaje Ghale — the recipient of the famous Victoria Cross medal. Gurung and Ghale people are the dominant population here. The village has all basic amenities like round the clock electricity, Internet facility, medical service and a few hotels. Regular bus service to Kathmandu is available from the village except during monsoon. Clustered stone-roofed houses, stone built narrow alleys and panoramic view of Buddha Himal are the major attractions of Barpak. For accommodation, the village offers well organized home stay facility along with standard hotels. Barpak has gained many national and international acclaims. The village was nominated as a unique destination in Nepal for Nepal Tourism Year 2011. It has hosted a number of prominent personalities like former chancellor of Germany Dr Roman Herzog. Overnight at Home-Stay. A walk from about six hours from Barpak via Basukang — a junction that also leads to Rupina La Pass, which is popular among Manaslu trekkers -- takes us to the beautiful Laprak village (2100m). The village lies in a landslide vulnerable zone. The landslide in 1999 had swept away houses and about 12 hectares of cultivable land. Since then, the villagers have been living in constant fear, especially during monsoon. Unlike other villages in Nepal, this single village forms the entire Laprak Village Development Committee (VDC). All nine wards of Laprak VDC are clustered tougher in this village. Temperature in the village is warm and cool from April to October. The weather becomes cold from November to March. Massive snowfalls occur in the village during this time of year. This typical Gurung village is also a popular stopover for the Manaslu trekkers. There are 2 hotels in the village, which is accessible from Tatopani in the east and Gumda village in the south. The village is the birthplace of late Iman Singh Gurung — the first person from the Gurung community from western Nepal to summit Mt Everest. Most of the villagers are engaged in tourism business and few of them have also earned international recognition. Overnight at Home-Stay. A moderate walk of around four hours takes us to Lambai Kharka (2700m). As the name suggests, Lambai Kharka (kharka means pastureland in local dialect) is an open pasture land with a few temporary houses of Laprakis (people of Laprak) which provide them shelter during plantation and potato harvest season. Trekkers need to be self-sufficient for food and lodging. There is no toilet facility as well. In Nambai Kharka, trekkers are advised to stick with vegetarian diet as locals believe that trekkers will take ill if they slaughter animals. Overnight at tented camp. On this day, we woke up early and climb to the top of Dharche Danda (3220m). Dharche Danda — the highest point of the Lower Manaslu Trek -- offers excellent sunrise views and a breathtaking 180 degree panoramic view of more than 20 Himalayan peaks like Annapurna I, Annapurna II, Bharatsikhar, Gangapurna, Machhapuchhre, Lamtang, Himalchuli, Buddha Himal, Sarang Peak, Malkunti Peak, Babu Himal, Sringi Himal, Ganesh I, Ganesh II and Ganesh III. Dharche Danda holds great religious significance among Gurung people. They offer prayer to the hill deity to avoid natural calamities. Also no felling of trees is allowed in the area. 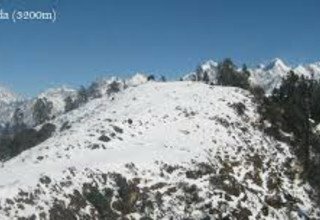 It is also believed that if tourists offer prayer to the hill deity, they will be blessed with clear visibility and will ward off misfortune while on trek. After enjoying sunrise and mountain views, we descend toward another Gurung village called Tallo Thotneri. The journey takes about seven hours in total. Though no commercial lodging facility is available here, there is excellent home stay facility in the village. Villagers also showcase their traditional dances and offer local delicacies. Sita Cave and Olajung Danda are the other attractions in and around Tallo Thotneri. Overnight at Home-Stay. The trek on the ninth day progresses toward Sita Cave (1165m) that lies about 1.8 km from Tallo Thotneri. The cave, which lies in the middle of a dense forest, holds a religious significance among Hindus and it is one of the major tourist attractions in the area. On the day of Ram Nawami, which is celebrated on the ninth day of the bright fortnight of the Hindu month of Chaitra (March/April), thousands of devotees gather to pay homage to Lord Ram. Goddess Sita, wife of Lord Ram, is believed to have stayed in the cave. The caving experience is thrilling and adventurous. After touring the cave, we trek toward Gyampesal -- the final destination of the trek. The trek takes about a few hours from Sita Cave. Accommodation at Gyampesal is on tent or home stay. Overnight at Home-Stay. Today we drive back to Kathmandu by our private land cruiser which takes around 7 hours and transfer to Hotel. * 2 nights accommodations with breakfast at 3***hotel in Kathmandu. * Home-Stay accommodation during the trek. accommodation, salary, equipments & insurance.